Video Links Testimonials FAQs Did you know? Australia’s FIRST Synthetic Arena Surface product – SOILTEX is in stock for delivery. SOILTEX is a unique solution to improve equine soil structure. SOILTEX is widely used on any indoor and outdoor horse working area. The unique soil structure that SOILTEX provides firmness and stability with optimum cushioning which will protect the tendons and joints of the horses. SOILTEX keeps the working area together, reduces the puddle forming due to the sponge effect of the shreds and fibre used. SOILTEX is used by leading European and Australian riders in a variety of disciplines. It is suitable for both indoor and outdoor arenas. 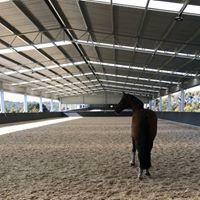 Proven and installed on almost 300 equestrian surfaces in Australia. 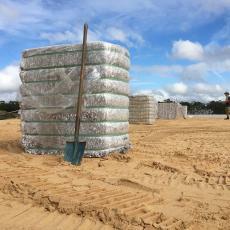 SOILTEX is supplied in bales - divide your working area into even sections. Open one bale at a time and spread evenly over the entire section, apply water to the SOILTEX so it is soaked. Blend the SOILTEX into your sand using a rotary hoe or similar. SOILTEX blended into existing sand. Installed in Somersby on the Central Coast (NSW). 20 x 60m Covered Arena.